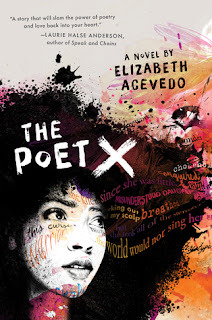 "The Poet X" is a raw and powerful coming of age story, that will give you chills whilst reading it. It follows 15-year-old Xiomara, who uses slam poetry to navigate her feelings towards religion, her oppressive mother, love and body acceptance. I did not have much experience with novels written through verse prior to this book, but I was hooked from the first page. When you highlight 50% of the book, you know you`ve connected with a story. "It`s not any one thing that makes me wonder about the capital G.O.D. About a holy trinity that don't include the mother. It`s all the things. Just seems as I got older I began to really see the way that church treats a girl like me differently. Sometimes it feels all I`m worth is under my skirt and not between my ears. Sometimes I feel that turning the other cheek could get someone like my brother killed. Sometimes I feel my life would be easier if I didn`t feel like such a debt to a God that don`t really seem to be out here checking for me." Like I mentioned earlier, this book addresses topics that will make people uncomfortable. I`m not that religious, but I wanted to see how some Christian reviewers felt about the book. And the response on Goodreads has been absolutely positive. Because at its core, this book is by no means an attack towards religion (in case some people might wrongly get offended). It`s the journey of a girl trying to figure out her relationship with God. A girl that deals with a tyrannical mother and an absent father.
" When your body takes up more room than your voice you are always the target of well-aimed rumours, which is why I let my knuckles talk for me. Which is why I learned to shrug when my name was replaced by insults." Xiomara is more developed than other girls, and she is used to unwanted attention from boys and even men. Quiet in class, she fights when she feels there`s no other solution. Until she discovers slam poetry, and she learns how to cope with her anger. And when she meets Aman, she starts to fall in love for the first time, and let her guard down. Their romance is sweet, and it allows Xiomara to see herself in a positive way. Their relationship makes her realize that she`s more than a body to boys. Despite the fact that this book is emotional and thought-provoking, there are some sweet moments in there. I loved the relationship between Xiomara and her best friend, Caridad. Unlike X, Caridad is completely devoted to God. But she never judges Xiomara, and she`s always there for her. I also adored the complicated relationship between Xiomara and Xavier, her twin. She`s the black sheep of the family, whilst he`s the Golden Boy.
" And I wonder if Twin and I are keeping each other small. Taking up the space that would have let the other grow. " However, little does Xiomara know that her brother hides a secret of his own. He`s gay, something that their parents/community would never understand. Twin was a multi-layered character, that I`ve grown to love more and more throughout the book. He`s talented and smart, with a bright future ahead of him. Like his sister, he's quiet and likes to keep things to himself. Twin and Xiomara fight a lot, but they also love each other unconditionally and have a bond that does not need words. As you can see, there`s not one thing that I disliked about this book. It had such a positive message about accepting yourself and standing up for what you believe in. If I could, I`d give this book more than 5/5 stars. Absolutely brilliant! This sounds so good! It wasn't really on my radar before because I'm iffy about verse but I'll have to check it out!